The menu Between Italy And France is unavailable at that date. Chef Francesco Calvani is unavailable on this date. 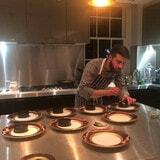 Check chef Francesco Calvani's calendar. Chef Francesco Calvani is unavailable in this city.